The Office 365 Message Tracking tool is used to check and efficiently resolve the status of business email flow. Exchange Admin Center (EAC) is the web-based management console used to achieve the process of email tracking in a proficient way. In this you will know about what’s new Message Trace in Office 365 Security & Compliance center. Although, Message trace feature in EAC has lots of downside. In order to make it more simple and facile, Microsoft reconstructs mail flow troubleshooting message trace tool and put it in the Office 365 Security & Compliance center. In this blog, we will walk through the latest robust features and design of the new message tracking role in Office 365. Besides this, we will also compare the old and new interface of message trace tool. So, let’s get started! Let’s have a quick look at the previous message tracking system characteristics in EAC for Office 365. The intuitive user interface of Office 365 message trace in Exchange Admin Center is not complex and users can easily handle this. From the interface, one can only need to choose a date range, along with relevant details of the messages that users are searching for. Afterwards, click on Search and users will get all the information about Office 365 messages. However, if the Office 365 users wish to look for information about a particular mail, then one can only need to select that message. After that, all the details of mail will be displayed on the screen. Furthermore, the users can find and view lots of information about their messages within the organization. However, the details you can extract about messages for other environment is restricted. The above-mentioned system experience was not good and only provide the basic message tracking features. So, after making some changes in it, Microsoft releases a new message trace in Office 365 Security and Compliance Center under the Mail Flow rule section. When the users open it, they will find new two sections named as Message Trace & Dashboard. Let’s begin with the dashboard. Furthermore, the users will get a pictorial representation of all this information under the Dashboard panel. Now, let’s have a look on advanced Message trace in Office 365. The self-explanatory interface of the new system is made for administrators who are not having any exposure in message tracking. At the first glance in message trace section, users will see the five default queries that provided by Microsoft. These questions cover almost each and every information that Office 365 administrator search for. Apart from this, the users will perform various operations itself. Let’s consider a situation where the user did not receive an expected email in the inbox folder. For this, the initial step is to check the spam emails folder in Office 365. This can be easily done with the help of a simple search and users can easily view results on the screen. Adding to it, Filter results option is also provided whose function is to precise the original search as per the user instructions. Another amazing feature of this new system is to save the recent queries. It keeps the last 10 queries in ‘autosaved queries’ section. Additionally, it also offers to save queries as per your choice. Also, users will get 3 different types of report within it names as, Enhanced summary report, Summary report, and Extended report. If the users want the detailed info then select either Enhanced summary or Extended reports. Because these two are compiled using archived message trace data. Thus, it signifies that they can take a long time to create results, but will provide detailed information. On the other hand, Summary reports provide the details of last 10 days data while the other two mentioned 90 days of data. The EAC & Office 365 Security and Compliance Center display the similar results for all reports if execute against the same data along with same configuration. The only difference between both is the user interface, and result format. The new look of message tracking is simple and can be easily understood by the administrator. Note:- The message trace feature is not available for PowerShell cmdlets. 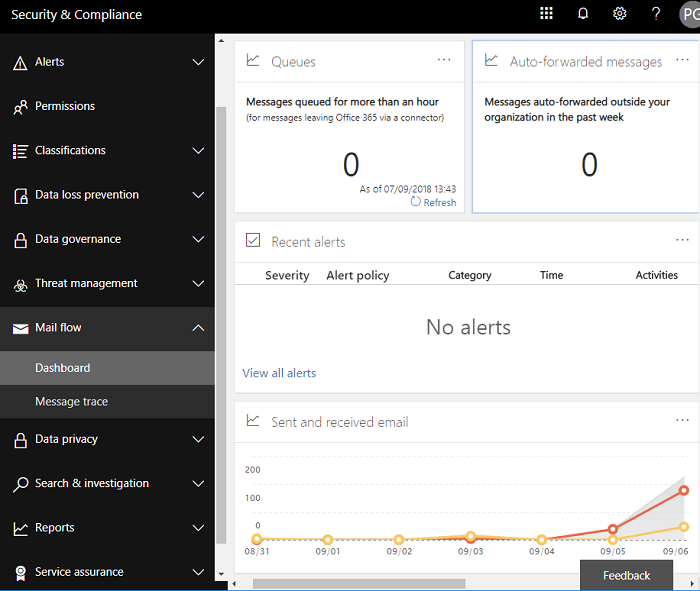 The new Message trace in Office 365 Security and Compliance Center is an advanced framework for better tracking of messages. The key updates in the message trace system are basically improvements in search and results panel. In short, the new intuitive interface is simple and easy to use & save lots of users time.